Let's be honest, it's April but the weather's still awful, cold, wet and windy. Hopefully we will see better weather and a lots of sunshine very soon. As you know, White Stuff is one of my favourite clothing brands on the high street. I like their comfy clothes made with high quality fabrics. For Spring and Summer 2018, White Stuff has plenty of great stuff for every one, and here are my 5 favourite polo shirts from their collection. A polo shirt is a basic in any mans wardrobe and one of my favourites for everyday and stylish casual wear. 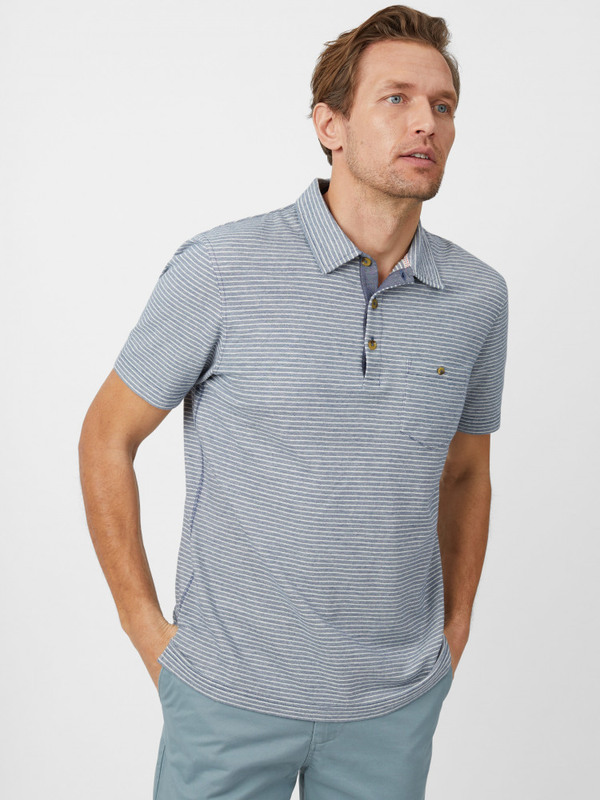 This polo is made with from a Textured Jacquard Fabric. It looks really stylish and perfect for late summer afternoon/early evening. This polo is perfect for daytime and everyday wear. The contrast colour on the inside of the collar is a nice touch! The Residence Polo is from the White Stuff smart range. That's the perfect Polo Shirt for spring and summer evening. It has 4 buttons down the collar. This polo shirt is probably one of my favourites of their new collection. It is made of 94% Cotton and 6% Polyester. The cut and style is what I call "casual stylish". This would be a perfect match with dark chinos or jeans. If you think that a Polo Shirt must have stripes, the new Cobra Stripe Polo by White Stuff is the one you need. Made with 100% soft cotton, this Polo Shirt is perfect for casual wear this Spring and Summer. Thank you for reading, and I hope you have enjoyed this fashion post. Which polo is your favourite? Leave your comments below and don't forget to follow me on Twitter and Instagram. Whatever the Games of Throne’s fans say, rest assured that Summer is coming. So with warmer days it’s time to look at the absolute classic clothing item for men: The Polo Shirt. 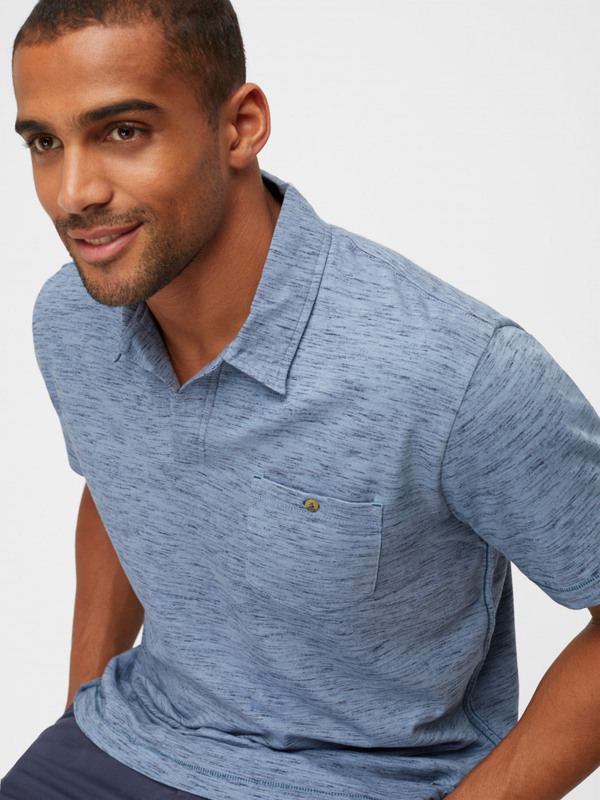 I am a big fan of polo shirts, even if lately I have purchased some nice t-shirts, this year I am going to get a few new polo shirts because designs are really great this year! Here are my 5 Best Men’s Polo Shirts for 2019. A few months ago, Chris Vannozzi the owner of Robin and Rhino, contacted me and sent me a personalised t-shirt for review purposes. Robin and Rhino tees are made to order and handmade in Sheffield, so you will receive your order within two weeks. Chinos are probably the most comfy and versatile trousers a man can wear and they are a must have in your wardrobe. Men over 35-40 don’t look great in a pair of skinny jeans with holes in the knees (honestly, who does anyway? ), so if you want to be fashionable and trendy, a great pair of chinos is the way to go. You can buy chinos everywhere but it can be difficult to find the ones with perfect fit, so here is my list of my 5 favourite chinos. I love this time of the year because it means that we can dress with more layers (bye bye shorts and tees!) and everything feels a little bit cosier. Today my post is all about the most important fashion accessories for men over 35 to get the perfect look for Autumn 2018. Last week I went to London for a special Christmas Event organised by one of my favourite UK brands: White Stuff. If you regularly read my blog, you'll know that I am a big fan of White Stuff. The quality and design of their clothes is excellent and perfect for a casual stylish look. So here are my favourite clothing items from their new autumn 2018 collection for men. You know that I am a big fan of Fat Face, I really like the quality of their clothes. So here is a selection of my 5 favourite men's clothing items that you should have in your wardrobe from the Fat Face Summer Sale. Scandinavian men should be an inspiration because they are always effortlessly stylish, and it’s all down to the timeless look. So today I am going to show you 5 must items for the perfect timeless wardrobe. The other day I received the Sprezzabox ( The Greenwich edition) and as I know a lot of you guys asked for it...here is my review. As Father’s day is fast approaching the team at Standout.co.uk has kindly sent me a bundle of clothes and accessories from their amazing selection of brands available in their shop. So this blog post is all about my experience with Standout and sharing my thoughts on the products they sell online. This season Checked Blazers are making a huge come back and they are more fashionable than ever. Here are my favourite ones for Spring-Summer 2018. Usually I am a Polo guy, but this year I am really into crew neck t-shirts. This summer you can go for the minimalist plain colour crew neck t-shirt or the printed one. So here is my selection of 'must have' men t-shirts for summer 2018. As you know, White Stuff is one of my favourite clothing brands on the high street. I like their comfy clothes made with high quality fabrics. For Spring and Summer 2018, White Stuff has plenty of great stuff for every one, and here are my 5 favourite polo shirts from their collection. Spring is around the corner and It's time to refresh your wardrobe! If you are not going to wear shirts or t-shirts from last year why not just give it to charity. It will help you free up some space in your wardrobe for new outfits and accessories. Spring is around the corner and this year it's all about plain, bold colours and no logo t-shirts. Today my post is all about the new Winter Collection of White Stuff. I am wearing a great pair of jeans, crew neck top and a super comfy loungewear top from White Stuff. Boots are a very important accessory in my wardrobe. Especially now with the winter season coming, they are part of my daily outfit. Here is a selection of my top 5 favourite Mens Boots from the most important retailers on the High Street. I really like White Stuff and their store concept. Buying clothes at White Stuff is definitely a pleasant experience. The new Autumn/Winter Collection 2017 for Men is out now, and here are my favourites. Fat Face has a new collection of Organic underwear for men. Here is my full review of the Fat Face Two Pack Rye Stripe Boxer Short. When Jack Wills contacted me to try and review some of their new items from the Sporting Goods Collection I was thrilled, because Jack Wills is one of my favourite clothing brands in the UK. Christian Benedict is a new company that promises to send you a brand new long sleeved quality shirt every month. This Spring/Summer it is all about T-Shirts. Here are my 5 favourite T-Shirts from my preferred High Street Retailers. Are you ready for your Summer Holidays? This year the swimming shorts are more fashionable than ever. Here are the 10 best swimming shorts for under £50. Geek Style is more fashionable than ever.